away from the shade caused by trees, buildings etc. and you can choose low light or high light mode. This new generation spotlight is updated from previous 4 LED Solar version. This spotlight equipped with light sensor and 6 chips, up to 300 Lumen output in high light mode..
One more spike to adjust the height. It is 2-in-1 design. It has a spike to stick into the ground. It also has a base for wall mounted. Automatic Switch-Auto on at night / Auto off after sunrise. Long working time, Within #18650 lithium rechargeable battery (2200mAh). It can light up to 8-10 hours after it's fully charged (at Low light mode). attic, front porch, balcony, walkway, driveway, etc. The switch is located at the back of the solar panel. Turn on the switch. the lamp will star to work automatically. 2-in-1 TOOL-FREE INSTALLATION: Stick into the ground / Mount on the wall using included screws. Perfect for lighting up your trees, Patio, Porch, Path, Deck, Yard Garden, Garage, Driveway and so on. 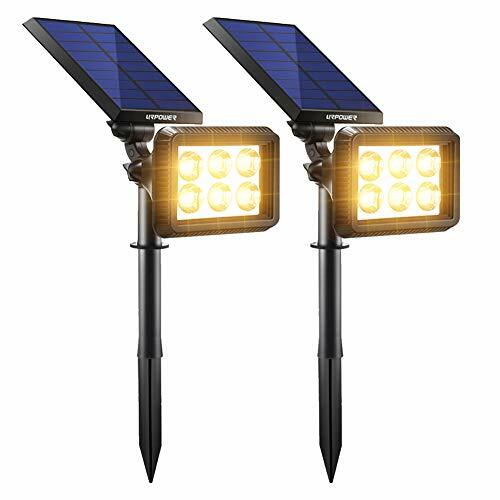 FULLY ADJUSTABLE LIGHT & SOLAR PANEL: The lamp lighting projector can be adjusted by 90 degrees, and the solar panel by 180 degrees. Enables lighting to be used exactly where needed and catch sunlight at optimum angle for charging. SOLAR POWERED & LONG WORKING TIME: Built-in 18650 lithium rechargeable battery (2200mAh), the new bigger solar panel will ensure it can light up 8-10 hours after 4-5 hours fully charged under direct sunlight. WATERPROOF IP64 & HEATPROOF: It can withstand rain and other extreme weather conditions. It's Durable to use. It is offered with 1-year warranty and lifetime friendly customer service.